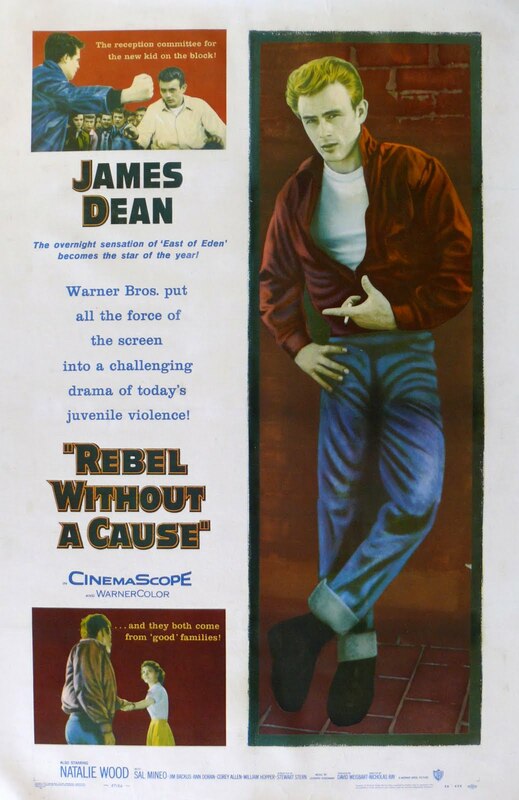 Rebel Without a Cause is one film of which so much has been written I hardly have anything new to contribute. Whether it's the legendary tales that have sprung up around the cult of its star, James Dean; the mysterious curse (proposed by some) which took its three leads' lives prematurely; or the film's embrace of the explosive Method style of acting; you can find a multitude of essays which pick the film apart from any number of perspectives. Continuing my look at some of the fifties' output of its director, I'd like to look at Nicholas Ray's collaborative relationship with Dean. Perhaps a lot of the success of Rebel may be due to the untimely death of its lead actor weeks before it opened. True, he wasn't yet a star, but he was surely headed in that direction. His iconic performances in his last two films, both released posthumously, secured his legend. But strictly speaking of his role in Rebel, its importance stems from the realism brought to the performance as encouraged by the progressive Ray. An associate of Elia Kazan and his Group Theatre, Ray met Dean while spending considerable time on Kazan's set for East of Eden (1955), Dean's first star turn. Impressed with the young man's ability to lose himself in the moment, he forged a synergistic partnership which supercharged Dean's performance as Jim Stark in Rebel. Ray was so sure he wanted Dean for the role the name Stark is said to have been a deliberate anagram of the name of the character he played in Eden, Cal Trask. Once production began, Ray also did much to make Dean comfortable on set, as it were. Ray's interaction with Allen, Dean, and the other young actors informed the film, giving Rebel Without a Cause a vibrancy and immediacy, an honesty seldom found in other youth pictures up until that time. (This may have been motivated by Ray's guilt over his personal deficiencies as a dad, which found their clearest expression in the tenuous relationship he had with son Anthony, who at thirteen had an affair with Ray's ex-wife, actress Gloria Grahame, their romance spurred by their growing mutual disdain for Ray. The two would later marry when Anthony was in his twenties.) Rebel Without a Cause gives us a nihilistic world where adults are relegated to supporting players in the dramatic lives of their children. Kids fall in love, react violently, kill, and die in a concentrated span of time lasting just about one full day. And Ray never presents it from any point-of-view other than that of the teens. Among the questions which can never be answered are: whether Dean's career might have continued on the same track had he lived; would Ray have continued to contribute to the young actor's success; and more unknowable, how would Dean have influenced the trajectory of Ray's career? What is certain is the influence Rebel Without a Cause has exerted on films today, films like The Breakfast Club (1985), The River's Edge (1987), Gus Van Sant's work (Elephant), and even Larry Clark's (Kids). What an excellent post! I love this film and never tire reading about it or talking about it. You are right to focus on the relationship between Dean and Ray which is why the film and Dean's performance in it are so memorable and continue to endure and fascinate after all these years. Also, I'm glad you mentioned RIVER'S EDGE as part of REBEL's legacy. I've been thinking of writing about RIVER'S EDGE and some of the themes you mention in your post as they pertain to REBEL could easily apply to that film as well. Excellent write up. I actually feel just as you do when you say the literature available on this film is almost overwhelming. I actually wrote a piece stretching the similarities between this and another 1955 flick (the now forgotten) Picnic. This is great (both the film and the piece), and I also enjoyed your "Johnny Guitar" write-up, as well. For me, the film takes off when Jim, Judy and Plato play "pretend" family at the end of the film in the mansion, with Jim learning the difficulty and harshness of parenting first-hand. Thanks for the compliment. Look forward to your piece on Hunter's film. Thanks for stopping by. I'm not sure I would agree with your assertion that PICNIC has been forgotten, though. ...Jim learning the difficulty and harshness of parenting first-hand. You know, in all the years I've watched this film, picked it apart in essays from different perspectives, and read analysis of it from many angles, the subject of the small family formed by Jim, Judy and Plato has appeared numerous times. But I don't think I've ever seen it taken to its logical conclusion as succintly and insightfully as you just did. This is an awesome piece Tony. I'm fascinated with Ray and specifically Rebel Without a Cause, and I think you've really tapped into what gives the film (and Dean's performance) that timeless quality that makes it so relevant and fascinating even today. Thanks, Drew. I hope you've been reading my other pieces on Ray's films. Next up, a review of the new Criterion Blu-ray of BIGGER THAN LIFE.